It gives me great pleasure to announce the launch of the brand new Alive with Clive Monthly Contests! Starting on May 2 through July 31, 2013, and every month thereafter, you will have the opportunity to win fabulous prizes every month in these contests by answering five questions every week about each show on This Week on Alive with Clive. Now, the most talented emerging and established singer/songwriters and bands in the world have even more reason to appear on Alive with Clive, because they are about to get much more exposure! To be entered in the contest, you need answer five questions from only one This Week on Alive with Clive show in any month, and you will increase your chances of winning a prize if you watch two or more This Week on Alive with Clive shows in any month. Starting at Noon on Thursday, May 2, 2013, and at Noon every Thursday thereafter, you will find a link to the five questions for each show on the Web page for This Week on Alive with Clive after you log into The Alive with Clive Global Community as a Member with your unique username and password. To enter the contest, you don’t have to be a Gold or Silver Member of The Alive with Clive Global Community. To become a Bronze Member of The Alive with Clive Global Community now, click here. The Prizes you can win will be provided by Members of The Alive with Clive Global Community. To give me time to obtain Prizes and fine-tune all aspects of the infrastructure and systems necessary to implement the Contest, the first “month” of the Contest will take place through July, 2013, and the Winners of the Prizes for the Alive with Clive Monthly Contest for the period ending on July 31, 2013, will be announced by Noon Eastern on August 5, 2013. If you or a business you represent would like to gain several weeks’ worth of phenomenal free exposure for a product or service you provide, please click here to register as a Member of The Alive with Clive Global Community if you have not already done so, and then fill out this form to tell me all about the prize you would like to offer. Your offer to provide a prize will not be considered unless and until you are a Member of The Alive with Clive Global Community. If your prize is selected, it will be shown through July 31, 2013, on the Web page created exclusively for Prizes For This Month’s Alive with Clive Monthly Contest, which you can see when you click here, and will be seen, potentially, by the thousands of people who visit the page. For the first Monthly Contest, I am going to limit the number of prizes to ten, and select the nine remaining prizes from those offered based on such criteria as value, popularity, utility, accessibility and uniqueness. In due course, after interest in these Monthly Alive with Clive Contests increases, I will accept and offer more prizes, although I will probably limit the number of prizes for any monthly contest to the 20 most valuable and desirable offered. As a provider of a Prize, you’ll need to send the Prize or the information necessary to benefit from the Prize to the winner of the Prize you are providing within five days after the day on which you receive the name and address of the winner of the Prize you are providing. As a Winner of a Prize, if your prize is in the form of a service, you may have to claim your prize within a specified number of days, or request an extension. Prizes can be in the form of tangible goods or services, digital products, discounts, coupons, subscriptions, tickets for events, or other items that convey value to the winner. They can be provided by any kind of entrepreneur or business, from solopreneurs just starting out to companies in the Fortune 100, and singer/songwriters who’d like to attract attention to their music are encouraged to offer their CDs or house concerts as prizes too! 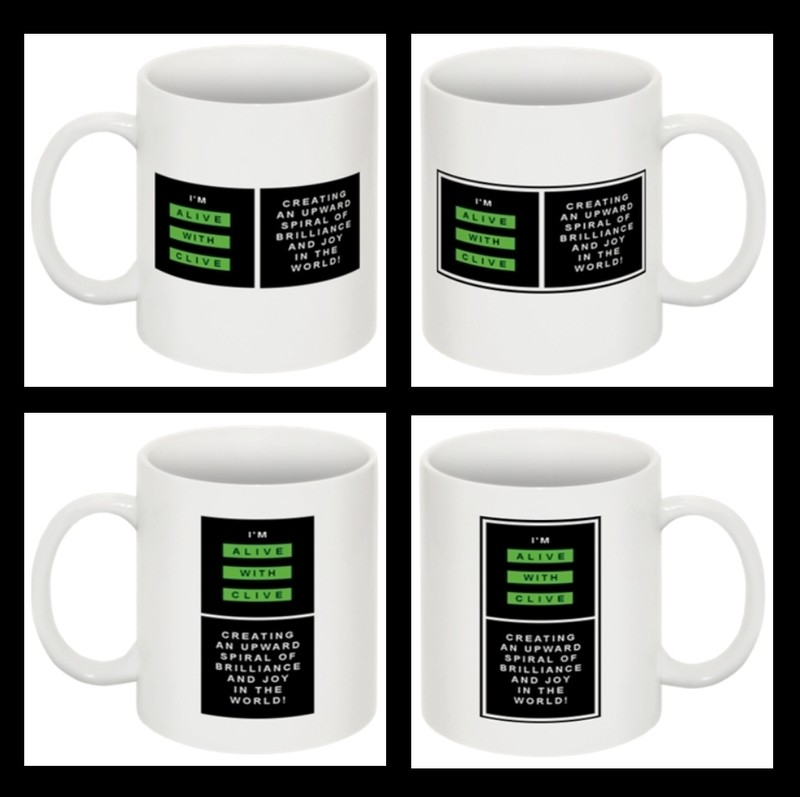 For example, one of the prizes for this first Alive with Clive Monthly Contest is going to be a set of four beautiful “I’m Alive with Clive” Mugs worth $99.97! A list of charities will soon be posted on my Web site. The charity on this list that receives the most nominations by viewers of This Week on Alive with Clive who enter the first Contest will be awarded with a benefit concert I will help to promote at which singer/songwriters who have appeared on Alive with Clive will be selected to perform. Charities will thus have an incentive to encourage their supporters to participate in the Contest and as a result the singer/songwriters who appear on Alive with Clive, and the businesses and entrepreneurs who provide selected Prizes, will be seen by many more people. If you represent a charity that would like to be included on the list, please send an email to me at clive at alivewithclive.tv (use @ sign for at) with the words “Charity for AWC Monthly Contest” on the subject line. I’m excited about these Contests and look forward to seeing the enthusiasm and interest they are destined to generate not just for the singer/songwriters and bands featured on Alive with Clive, but for all who provide Prizes that are selected as well! So, if you or a business you represent would like to offer a Prize to be selected as one of the Top 10 for this first Alive with Clive Monthly Contest, please click here to register for free as a Bronze Member of The Alive with Clive Global Community (if you haven’t already done so), and then fill out the form you’ll see when you click here. I look forward to receiving your submissions for Prizes by 11.59 p.m. Eastern on Friday, May 24, and entries in the first Alive with Clive Monthly Contest during the period from Noon on May 2 until July 31, 2013. This entry was posted in Alive with Clive Contests and tagged "I'm Alive with Clive" Mugs, Alive with Clive, Alive with Clive Global Community, Alive with Clive Monthly Contests, Alive with Clive TV Show, answers to five questions, brilliance and joy, Bronze Member, business, CDs, coupons, digital products, discounts, entrepreneur, events, exposure, five questions, Fortune 100, Global Community, Gold Memberd, Guest, house concert, house concerts, Inspiration, interview, magnificence, Monthly Contests, multiplying magnificence, no-cost advertising, prize, prize offering, prize offerings, prize submission form, prizes, services, Set of 4 Alive with Clive Mugs, Silver Member, singer/songwriters, solopreneur, subscriptions, tangible goods, This Week on Alive with Clive, tickets, TV show, upward spiral, upward spiral of brilliance and joy, value, winner, winners. Bookmark the permalink.